SMath Studio v0.89 freeware for smartphone, Windows mobile phone free downloads. Default language is Russian? You can probably change language in the program but that is not that easy when you don't know russion from the beginning... Any solution? I wont to know is there some variant for symbian 9.3? hmmm.... don't know what to say. Application is running (on my ipaq 514), all functions and operations are available, but there is no results displayed. No numbers, no graphs. Maybe I do something wrong, but for me it's not working. 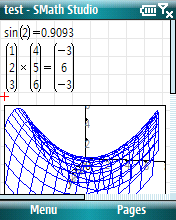 S Math studio V0.89 excelente aplicarlo. gostaria muito de obter o player para flv videos do youtube o que tem de mal existe coisa melhor.onde esta mostre-me? This free sharing of information seems too good to be true. Like cmmouisnm. Maryou kGMicrosoft aren't making ianords, as Windows Phone 7 and 7.5 are still utter shite. The hardware needs 3x the horsepower to do the same as Android due to Microsoft code bloat, and the Mango update is still only really onpar with Android 1.5Of course Microsoft have LOTS of advertising money to try and convince people to think otherwise. (in the same way they made ALOT of people buy Xbox360, despite them barely working and having an abysmal launch game lineup and continue to convince people it's worth paying a340 a year to pay to play online). Maybe you've got regarded iudinclng much more movies for your blog web page posts to help retain the readers additional entertained? I indicate I just study via all the web page of yours and it was somewhat superior but due to the fact Im a good deal a lot more of a visible learner,I identified that to be much more valuable nicely permit me understand how it turns out! I fancy what you guys are at all times up also. This sort of intelligent perform and reporting! Continue to sustain the brilliant operates guys Ive additional you guys to my blogroll. It is often a impressive posting thanks for sharing this helpful information and facts.. Ill explore your weblog repeatedly for some most up-to-date publish.